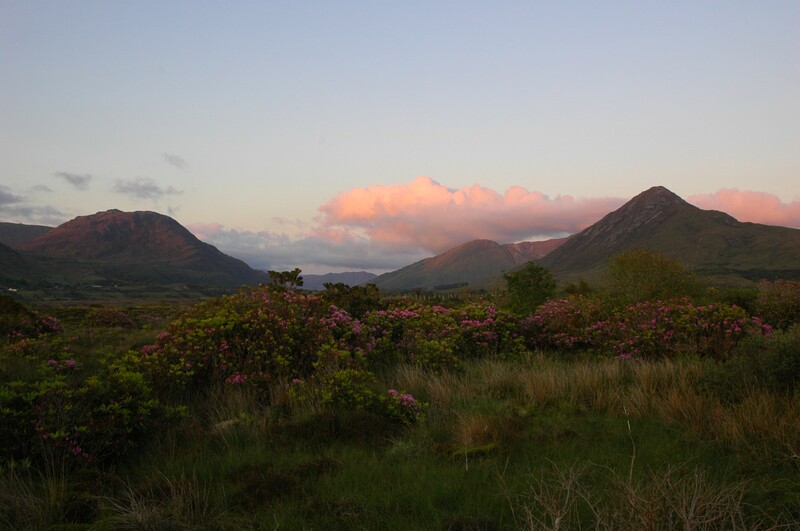 I had just returned to our cottage from an evening fishing alone, watching the sun set and the trout rise on Lough (Lake) Fee in Connemara, and found my wife and mother sitting in front of the glow of a peat fire, reading. “I love this place,” I suddenly gushed, somewhat to their astonishment. I’m not ordinarily given to gushing, but in this case I truly meant it. 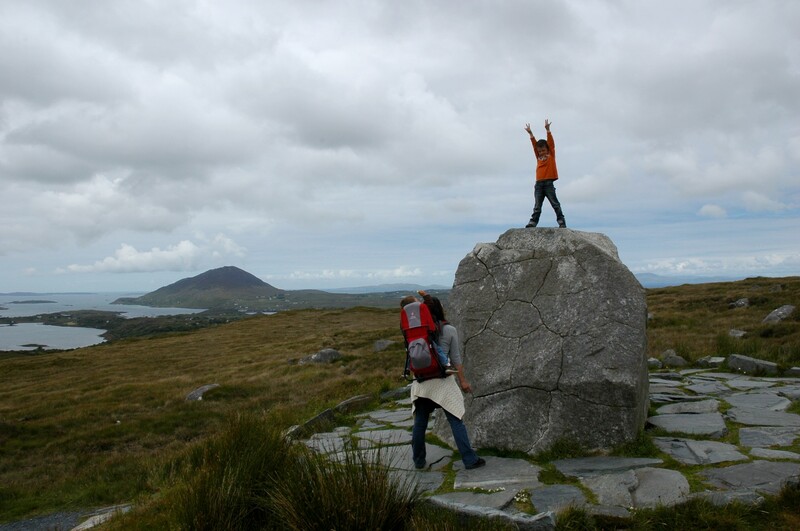 Connemara National Park and its surroundings lie in County Galway, Ireland, a rugged and craggy place dotted with little villages, glittering with clear lakes and streams, and ringed with lonely, lovely beaches. It is, in short, the perfect place for a mildly misanthropic fisherman who’s a bit rugged and craggy himself. 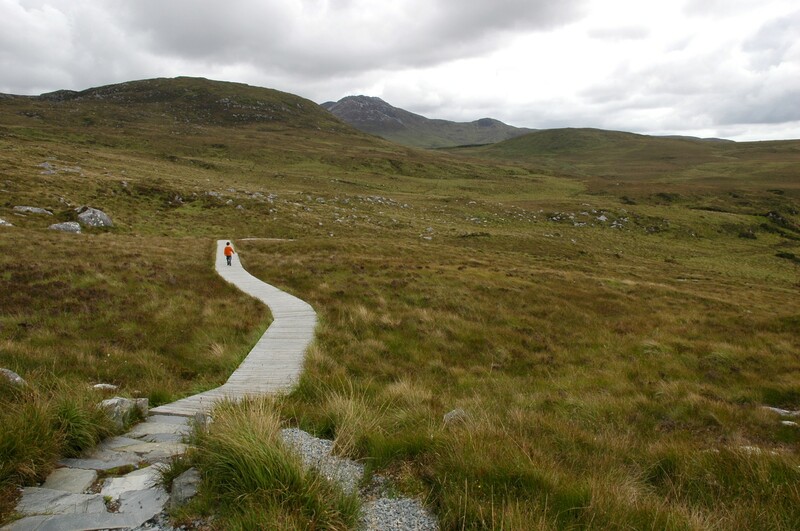 Although there are only four trails within the national park itself, they encompass wet bog lands brimming with carnivorous plants making a meager murderous living in this impoverished soil; higher, drier heathland covered with purple heather; and stony mountain passes where saxifrages and sorrel cling to nooks in the bare rock. 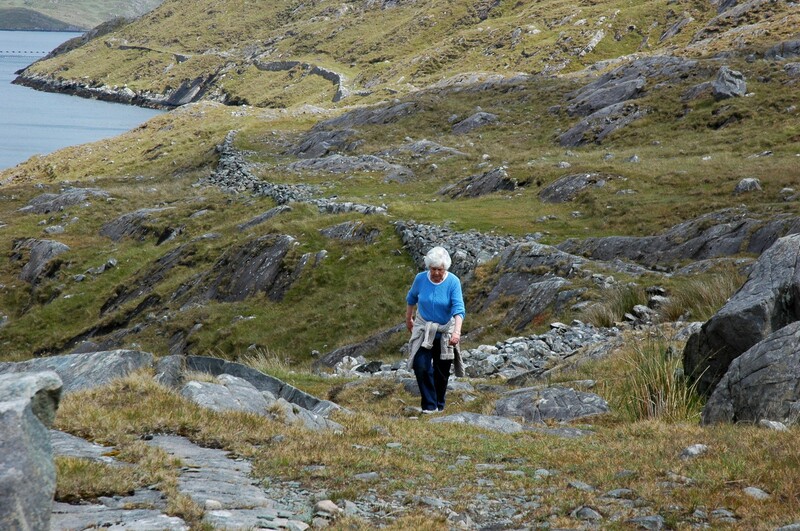 All of the trails are lovely, offering views of peninsulas jutting into the North Atlantic and offshore islands rising above the water like the backs of primordial reptiles. The folks in the Visitor’s Center are incredibly helpful, and the center’s exhibition on the area offers up detailed information on the history of the local area and its ecosystems. There’s a tea room which spills out onto a lovely courtyard, offering simple scones, salads and sandwiches that can be packed up to take with you on your hike. There’s also a great little playground, a stream which runs through the building, and two small ponds filled with fish and frogs. 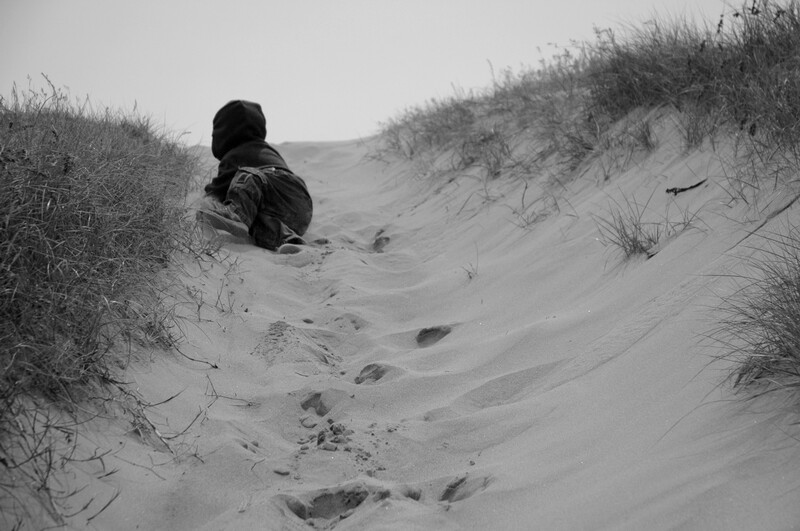 In fact, it may be difficult to drag the kids away from the Visitor’s Center to hit the trails. 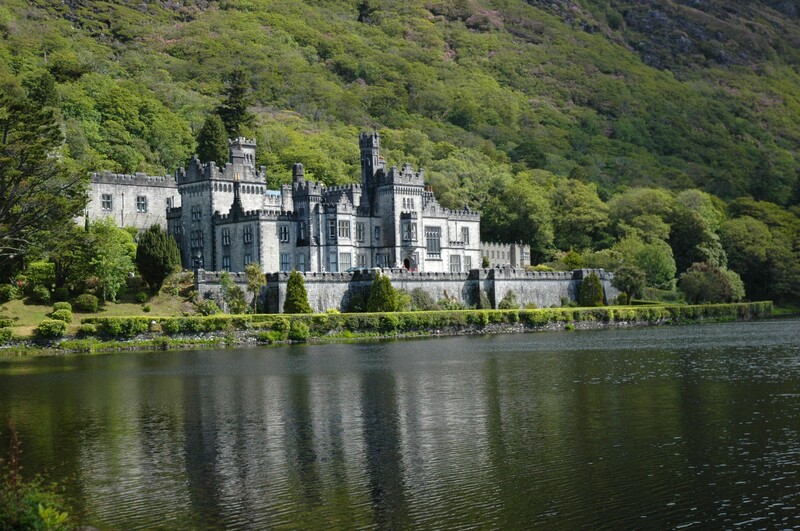 While you’re in the area, you’ll no doubt end up at Kylemore Abbey, the history of which includes a loving husband and benevolent landlord, a harried English duke and his profligate American bride, and a dedicated band of cash-strapped Belgian nuns. 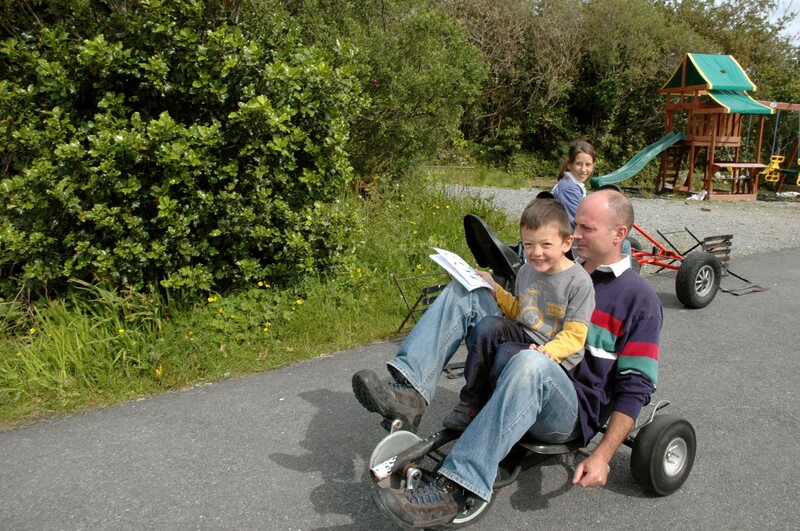 It’s the perfect place to spend a day with the kids, with a children’s play trail with 22 stations, “each inspired by a story of Kylemore and made using wood fallen naturally on the estate…[with] magically musical instruments, whispering trees and much more.” The walk to the Victorian Walled Garden is level and easy, and there are wonderful picnic areas throughout the grounds. You might want to pack a lunch, as the cafeteria’s food is mediocre at best and the lines stretch long when the tour busses begin to disgorge their hordes. 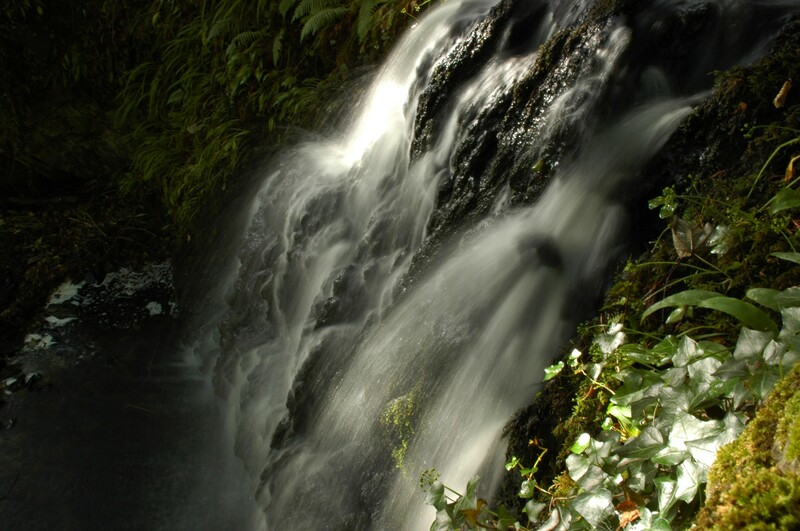 Visit Kylemore as early as you can to avoid the crush. 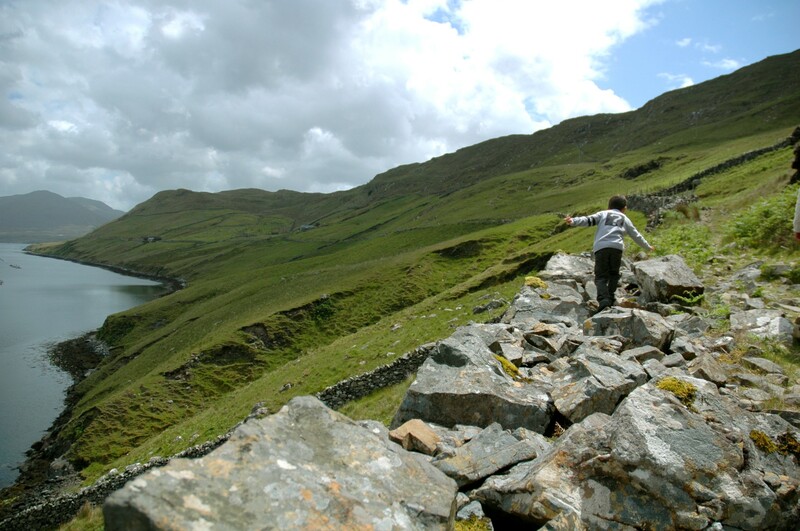 There are fantastic walking paths a bit farther afield as well. 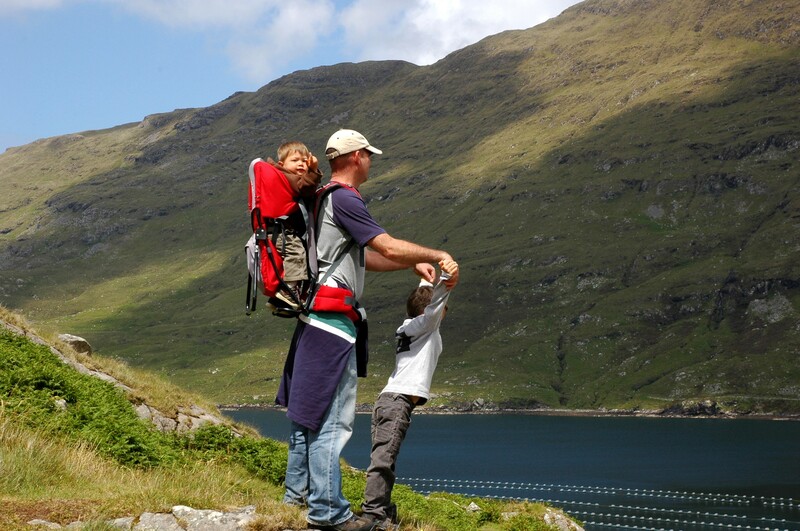 One of the nicest, and easiest with kids, is on the southern shore of Killary Harbor, either Ireland’s only fjord or one of only three, depending on which guide book you believe. 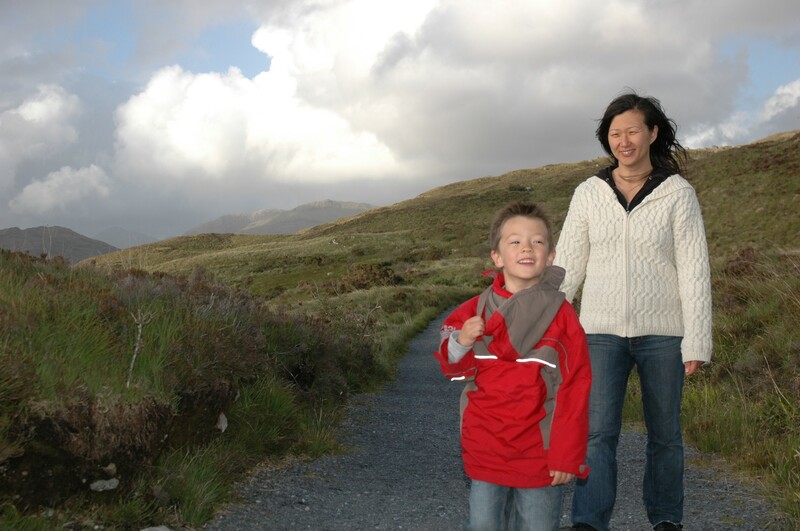 It can be done either as a loop or as an out-and-back, both of which are lovely, but the loop is about 10 miles (16 km) and entails long stretches of walking on the road – perhaps too long and too traffic-fraught to be appealing with young kids. 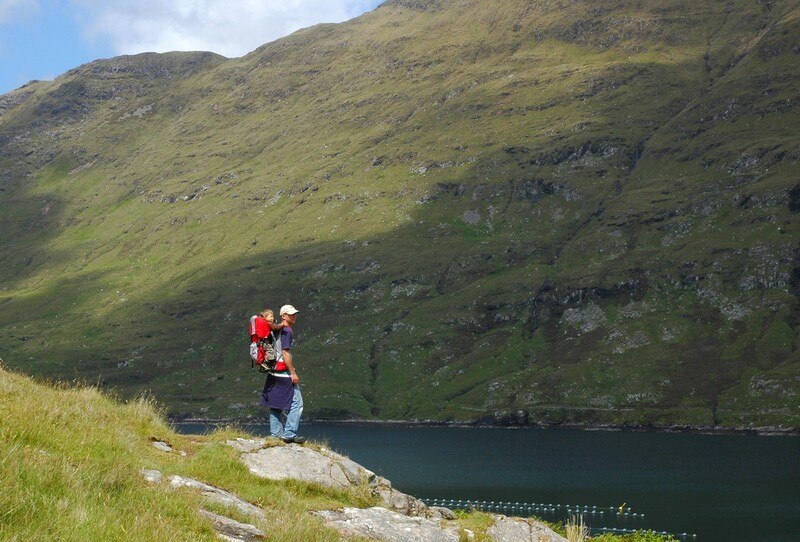 Starting in the tiny fishing village of Rosroe, the mostly-level trail winds along the shoreline, offering views across the harbor to the peaks of Mweelrea and Ben Gorm, white threads of waterfalls rushing down their flanks into the sea. 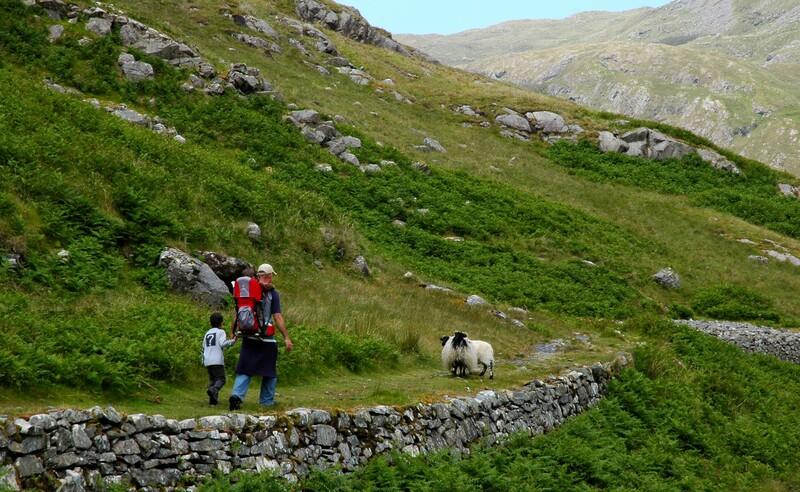 It’s a stunning walk, and the mild grade and ubiquitous sheep, puddles and streams make it easy and entertaining for kids. 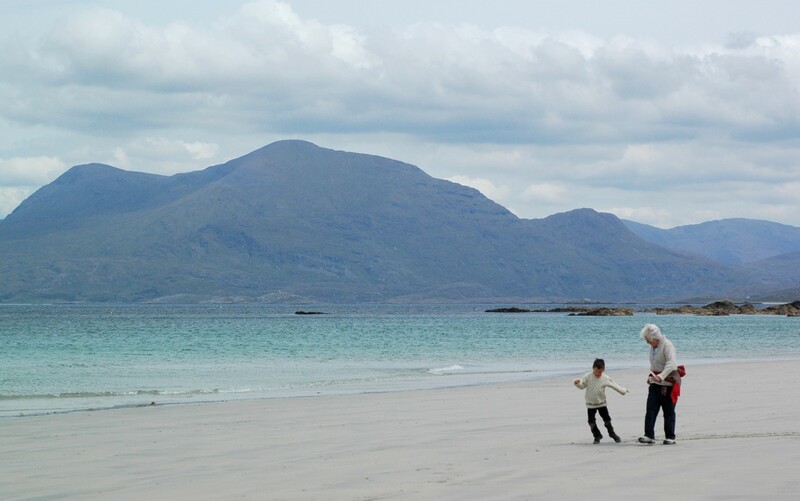 Connemara also has amazing beaches, and the Renvyle Peninsula is graced with some of the best. Long stretches of white sand and aquamarine water might put you in mind of more tropical climes, but leave the bikini at home and bring along the sweater and the windbreaker, because you’ll be needing both. 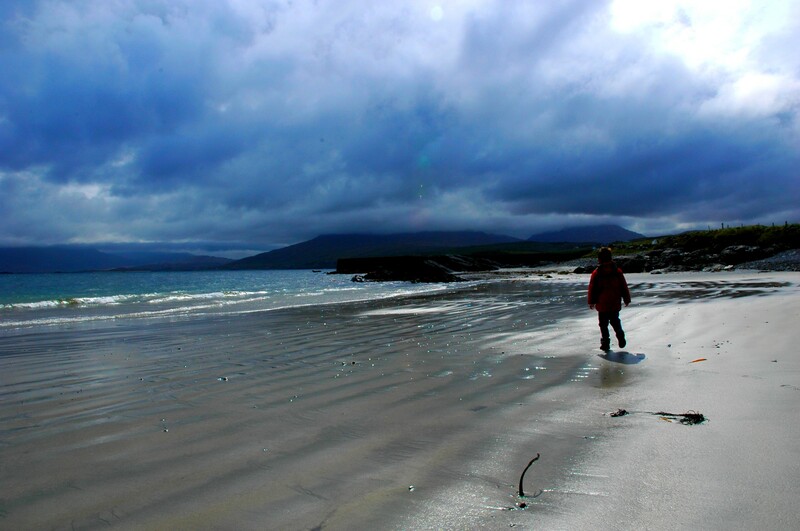 We walked Renvyle Beach in the middle of June, prior to the high season, and had it entirely to ourselves. 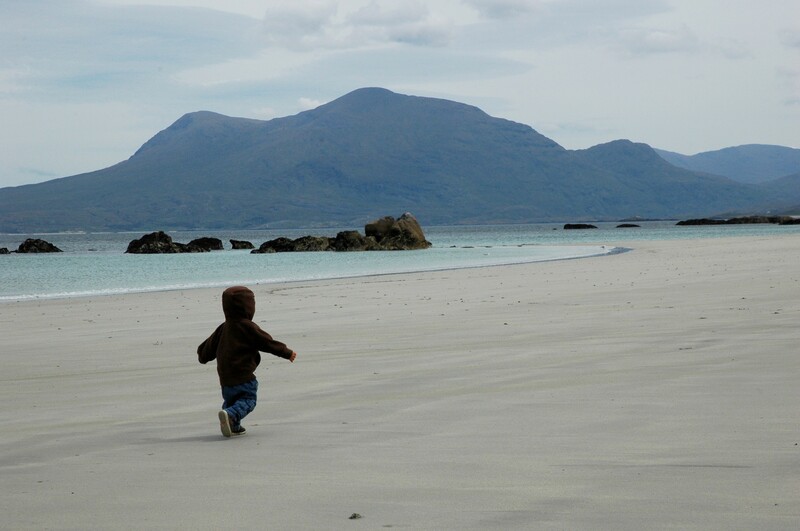 The westernmost mountains of the famed Twelve Bens loom deceptively close, and you can spend an entire day beachcombing, scaling the dunes backing the beach, or simply racing on the sand. 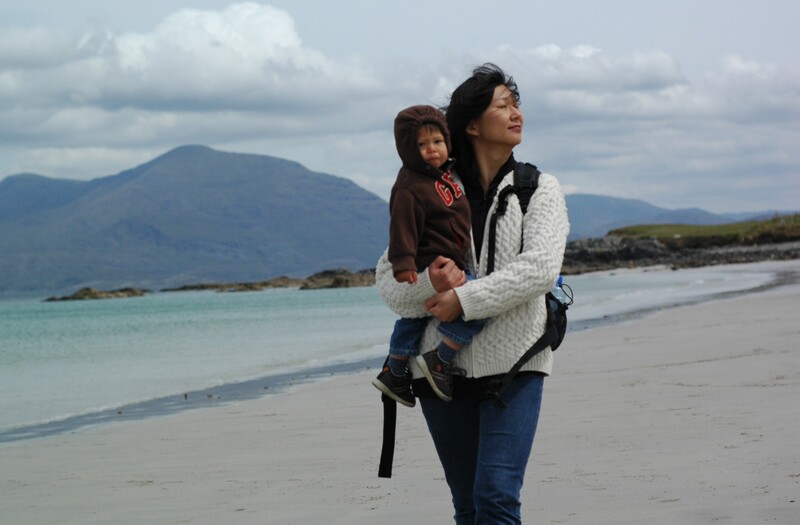 There are no facilities at the beach, so pack some food and drink, and have the kids use the bathroom before you go. 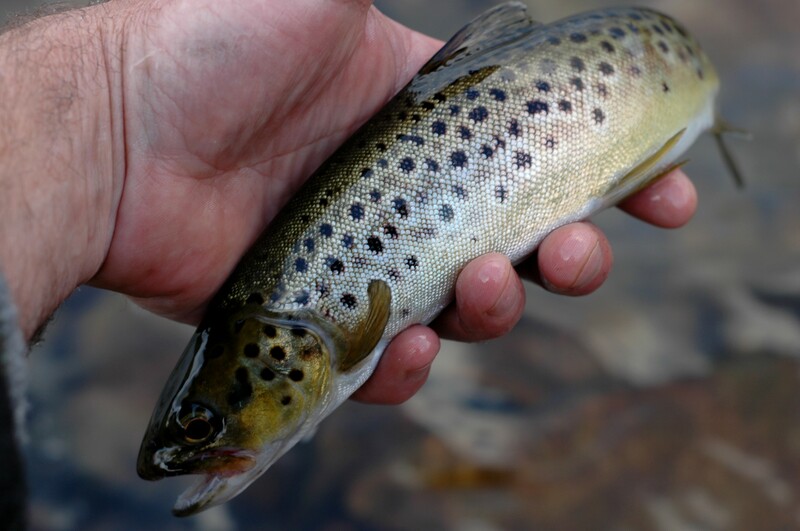 If you fancy a bit of fishing, there are some world-class waters in the area, particularly for fly fisherman. 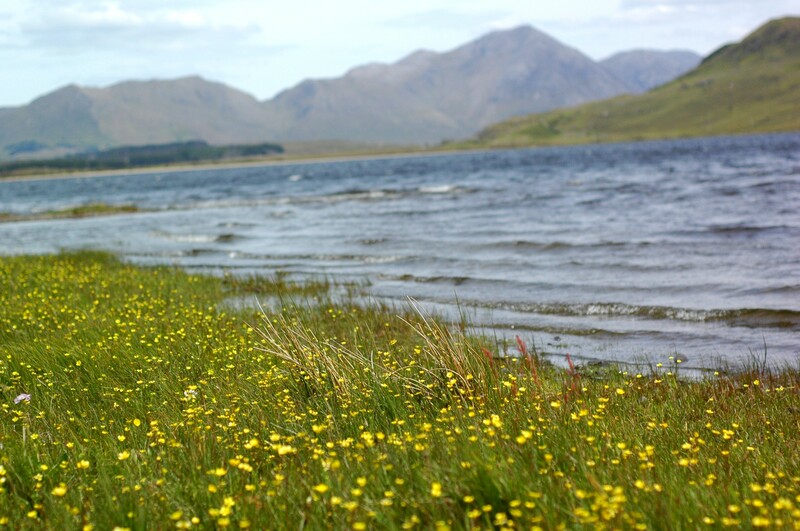 I don’t fly fish, so spent my time on the Culfin Fishery– which includes Lough Fee, Lough Muck, and the river which runs down to the beach near Culfin – where spin fishing is allowed. 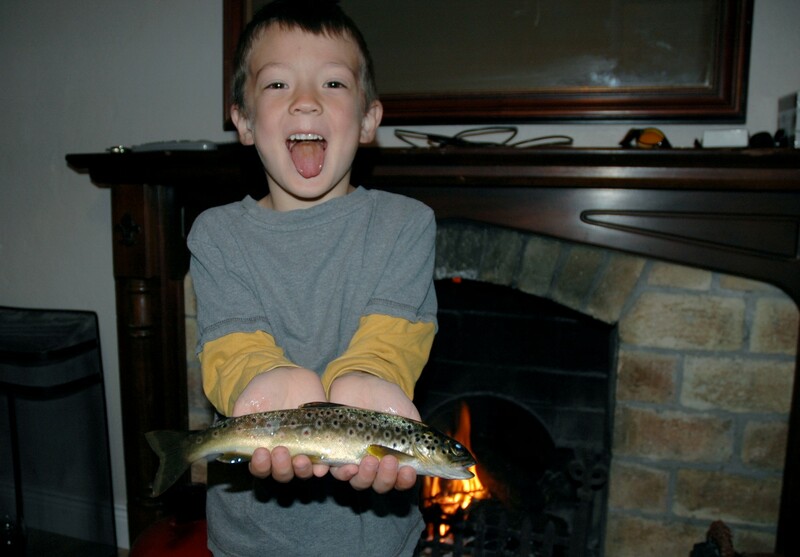 The lakes have very easy access and are great for young fishermen – my son, five at the time, caught some nice brown trout spinning from shore. Most of the fish are smallish, in the 10 – 14 inch range, but there’s a large population so the fishing is consistently satisfying. 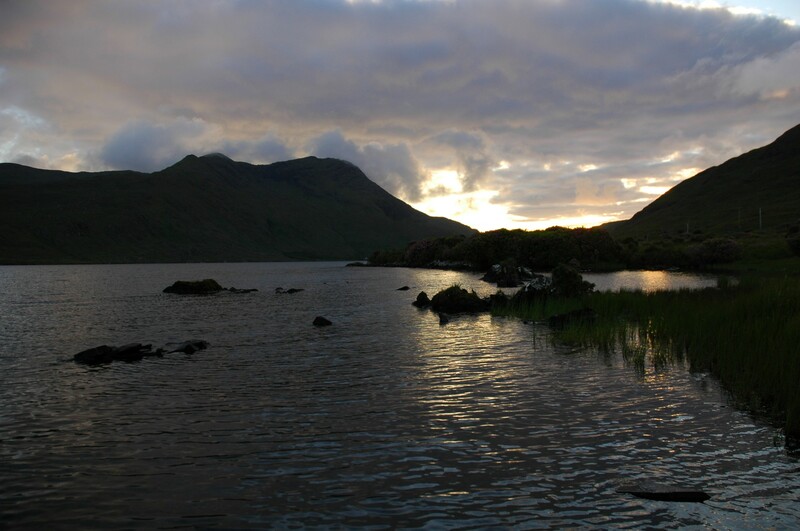 The sun sets late at this latitude – around 10 pm in June, when we were there – and it’s an almost overwhelming fishing experience to catch wild clear-water trout as you watch the light slowly creep up the mountainsides, flashing gold on the windows of remote cottages, the lake reflecting sun-limned clouds scudding across the evening sky. 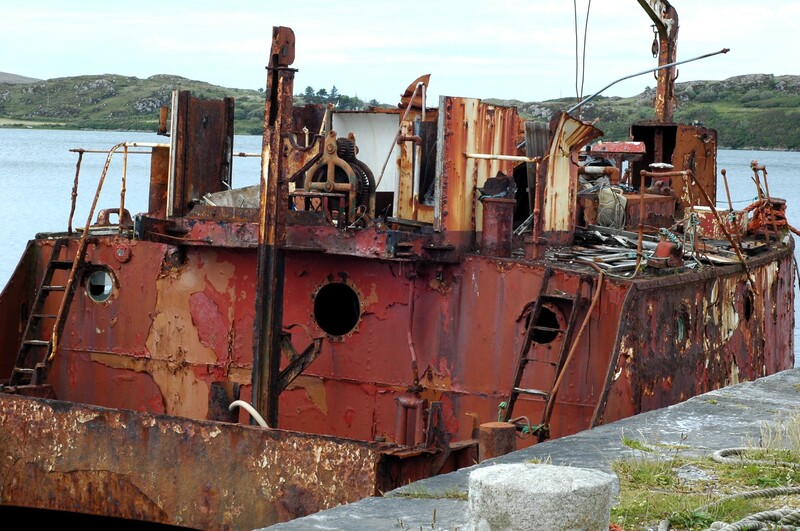 The town of Clifden is an attractive place for a day trip or even to use as a base while exploring the region. 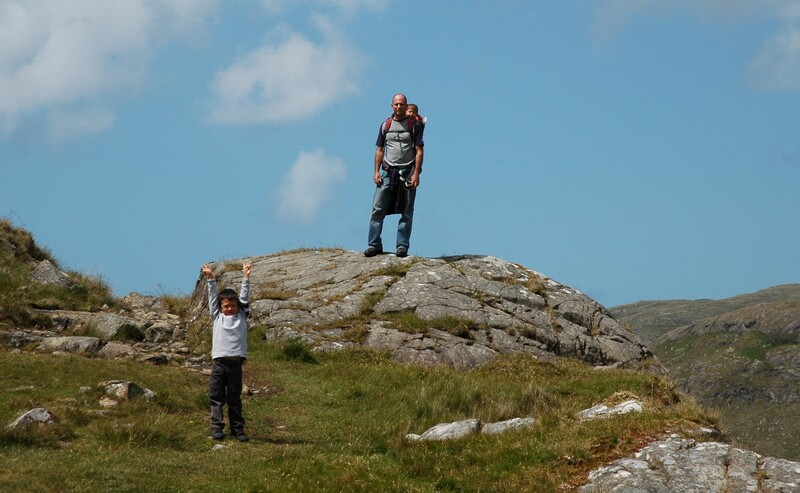 The ruins of Clifden Castle are worth a visit, although keep in mind that it’s a fairly steep slog up the hill for kids, with no shelter and no facilities when you get there. Go on a clear day, though, and the views over the bay are fabulous. 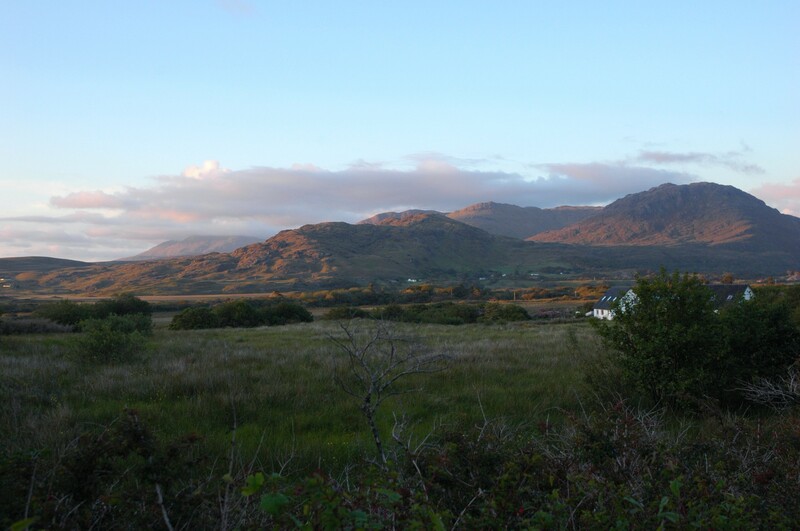 As the largest town in Connemara, Clifden has a wider range of accommodation and dining options than anywhere else. 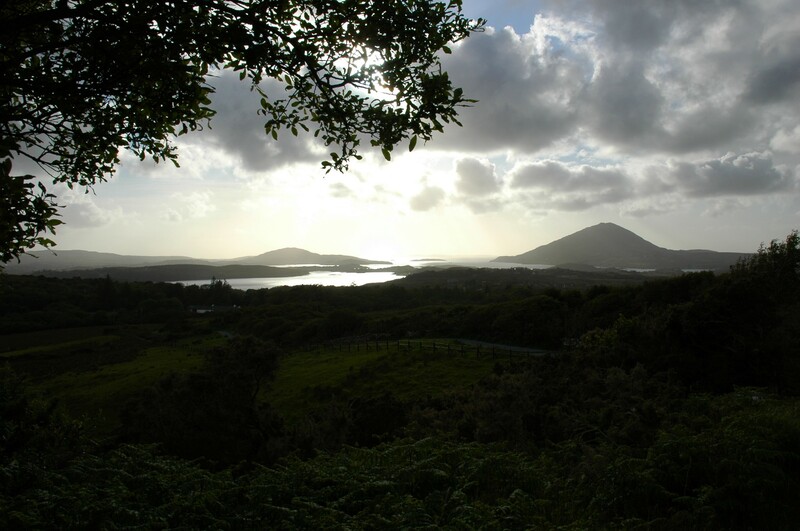 A pleasant scenic drive is a loop that runs around Connemara National Park. 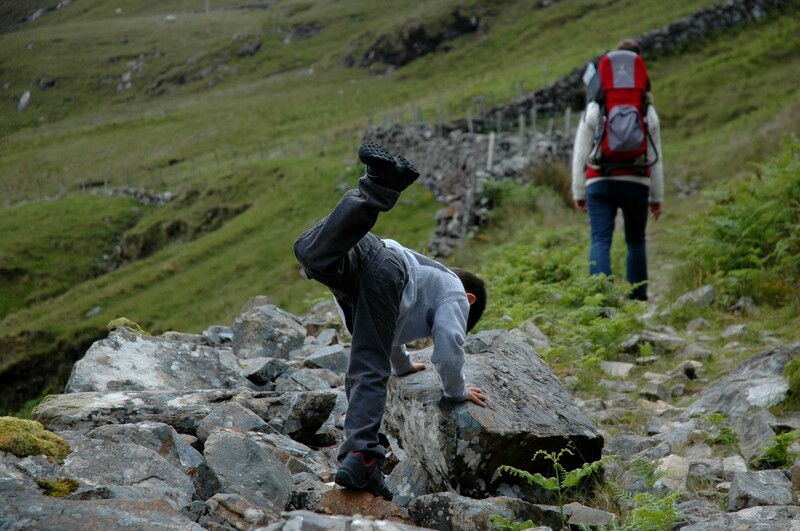 You could begin anywhere, it being a loop, but let’s say you set off from Clifden. 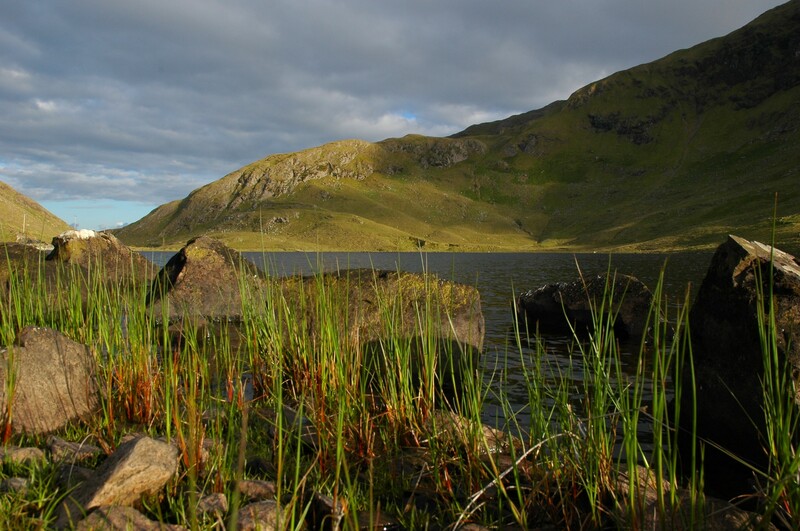 If you head east on N59, you’ll pass a number of lakes, the largest being Ballynahinch Lake on your right. Turn left onto R344, passing Derryclare Lough on the left. 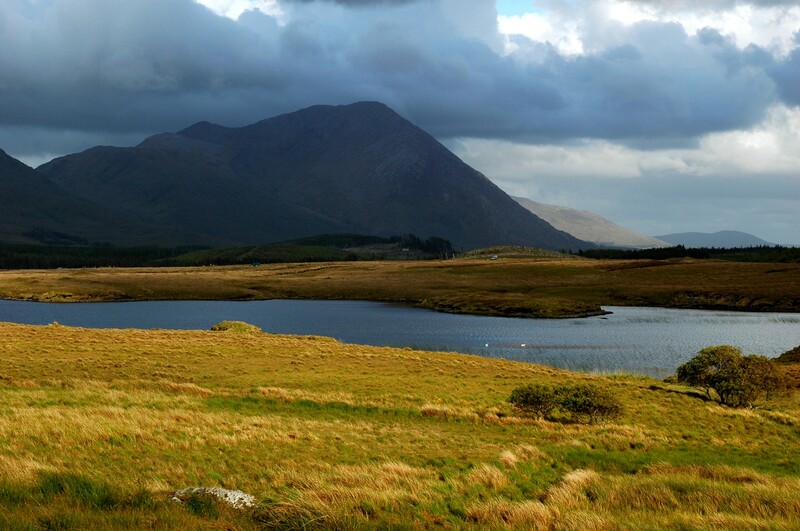 You’ll skirt the western edge of Lough Inagh, the peaks of Connemara rising dramatically behind it. 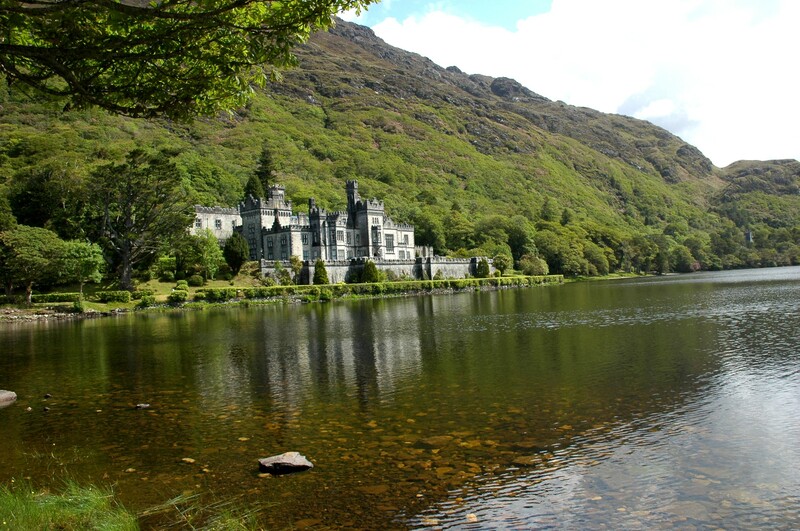 You’ll soon come to Kylemore Abbey, set on the far shores of the eponymous lake. You’ll drive for a while along the Dawros River, and if you’re a fisherman you’ll get a serious woodie looking at the riffles and falls and deep green pools. 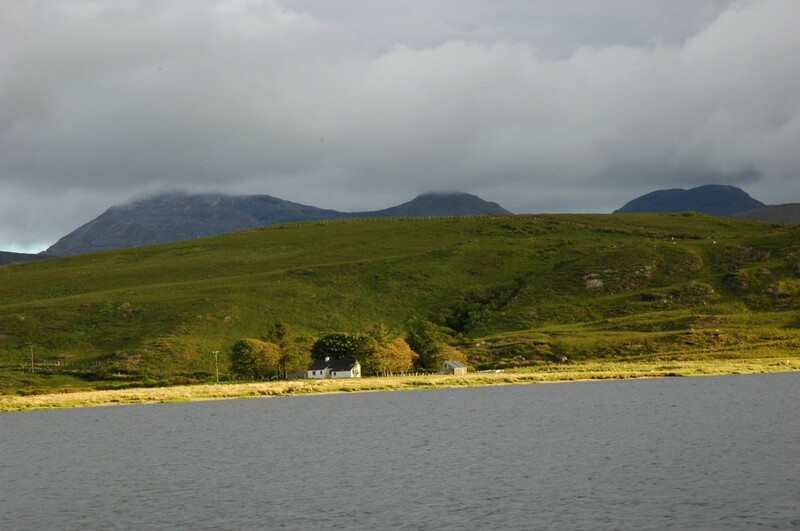 After you pass Letterfrack and the entrance to the Connemara National Park, you’ll come to a small bay with the lovely Rosleague Manor House perched on the far hillside. On the left you’ll arrive at the Avoca gift shop, which may perhaps not live up to its billing – you’ll see signs along the way proclaiming it as the most astounding (and affordable) shopping adventure since Jesus started offering loaves and fishes slashed to 70% off – but it has some lovely stuff on offer and is worth the stop. If your kids get bored you can take them across the street, where they can collect sea glass and shells from the slightly festering seaweed funk along the shore. The rest of the drive is less spectacular, but takes you through pleasant scenery back to Clifden. The entire loop, without stops, takes a little more than an hour. 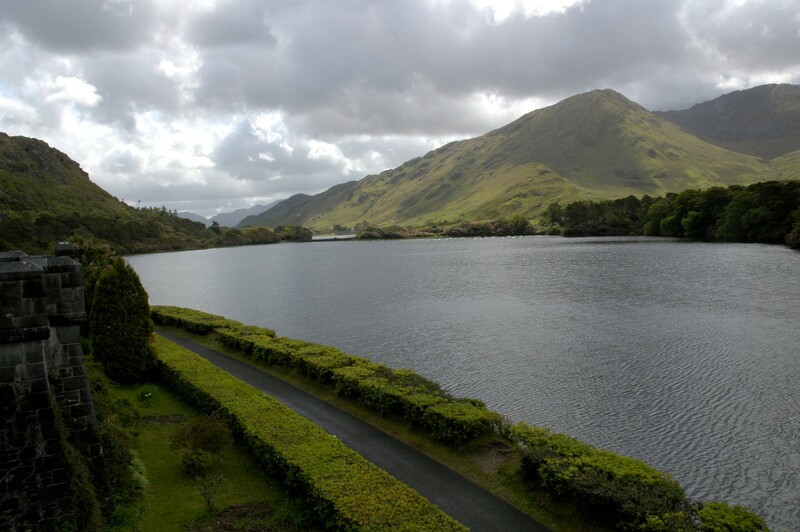 We chose Letterfrack as our base, because it sits right at the entrance to Connemara National Park, is only about 10 minutes from Kylemore Abbey, and lies close to the beaches on the Renvyle Peninsula. The town itself is not much more than a cluster of buildings strung along route N59, but it’s in a great location. There’s a good supermarket on the main road, and a decent pub in The Bards Den. We stayed at the Heatherhill Cottages, within walking distance of both the supermarket and the pub. The cottages were clean, comfortable, and very kid-friendly. The owners have a large brood of their own, and guests have access to lots of buggies and three-wheelers and other odd conveyances, as well as a playground. There are also pigs and chickens to feed and horses to ride. 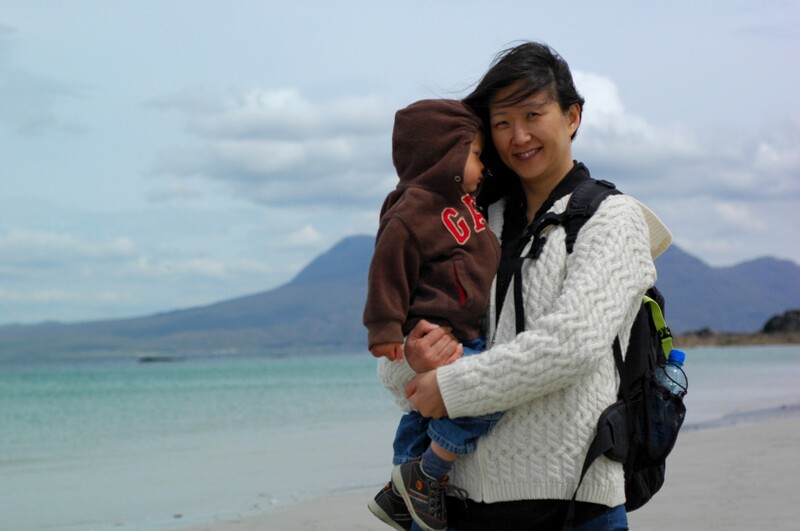 There are, of course, many amazing destinations in County Galway, and Shamrock Cottages is a good place to start if you’re looking for self-catering accommodation. 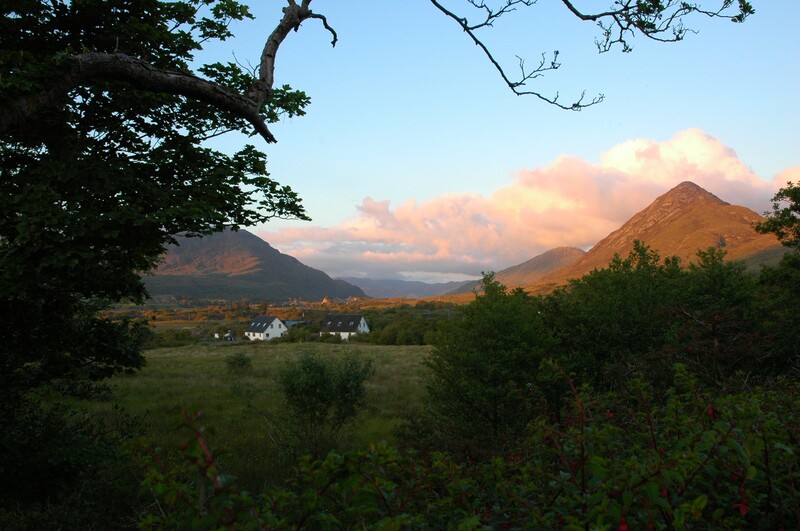 The Connemara Tourism website has fairly comprehensive listings of B&Bs and hotels in the area, as does DiscoverIreland.ie. Apart from The Bard’s Den, which has fairly standard pub food and decent beer on tap, Letterfrack has very limited dining options. 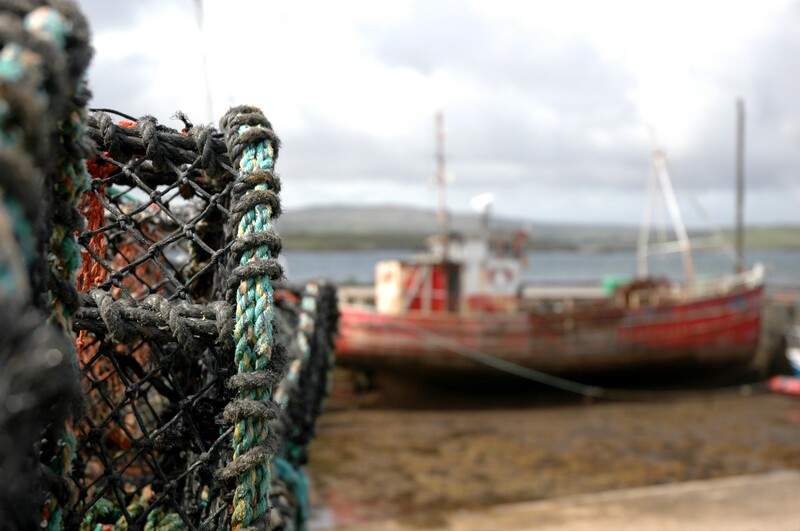 Tullycross is an absolutely charming little village, and Lydon Room Restaurant, located in the Maol Reidh Hotel, is outstanding. 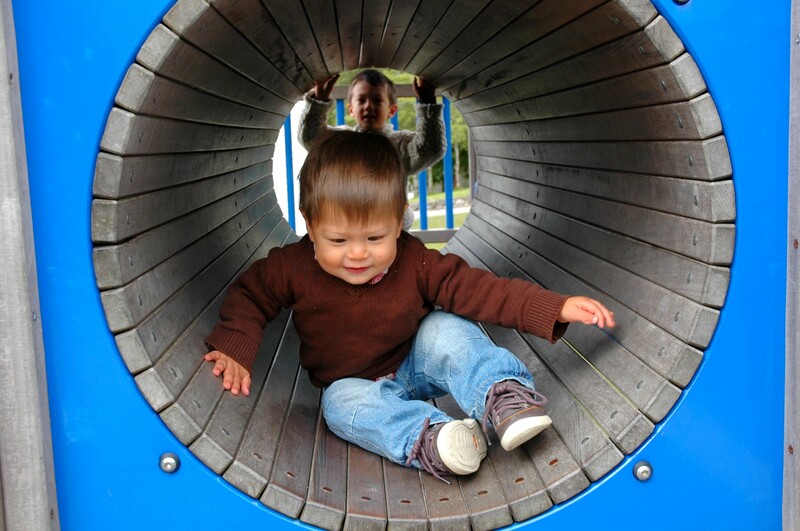 We dumped the kids on Grandma and made a date night of it, but there’s no reason you couldn’t take the rug rats. Great food in a friendly, slightly upscale atmosphere. 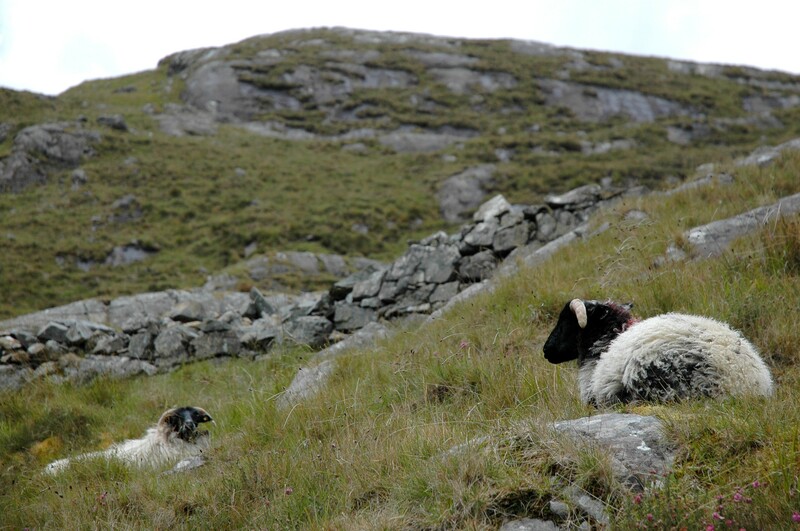 Try the Connemara lamb. Very highly recommended. After dinner at the Lydon Room pop next door to Paddy Coyne’s Public House, perhaps the most convivial pub in all of Ireland. A marvelous, marvelous pub. Extremely highly recommended. 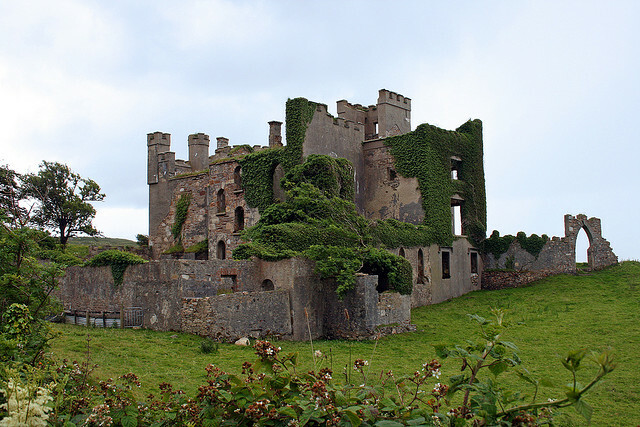 We had a bad lunch experience at the Renvyle House Hotel, getting shunted to uncomfortable seats in the pub and promptly being forgotten. The food was utterly forgettable, but I do remember it as being utterly forgettable. However, the place gets rave reviews for dinner, and it is in a lovely location. 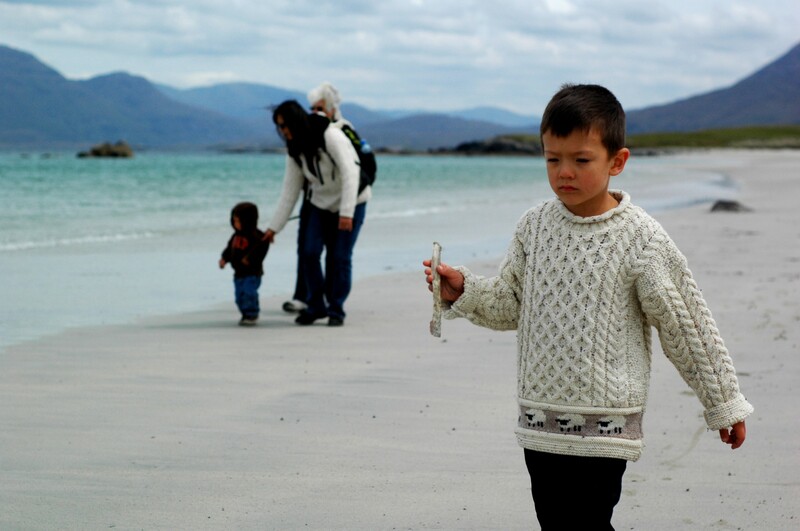 You can stroll along the shore, sighting oystercatchers and doing a bit of beachcombing before or after your meal. Watch out for the geese – they’ll attack if you get too close. Recommended, but with caveats. 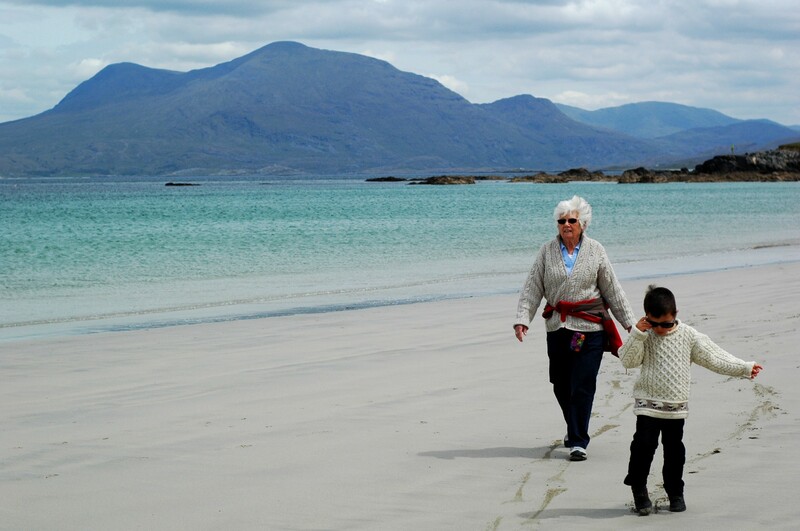 Connemara is a wonderful destination if you’re looking to get off the most-trodden tourist paths in Ireland. 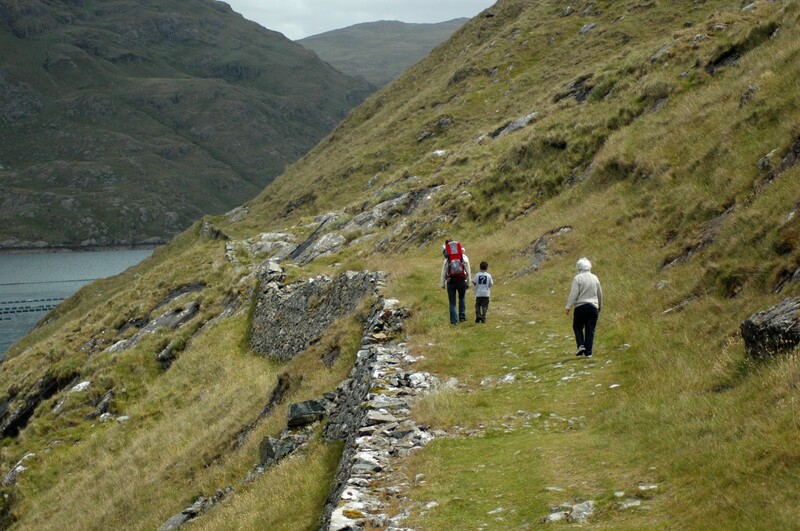 It still gets its fair share of visitors, but it never (except at Kylemore Abbey) felt overrun. 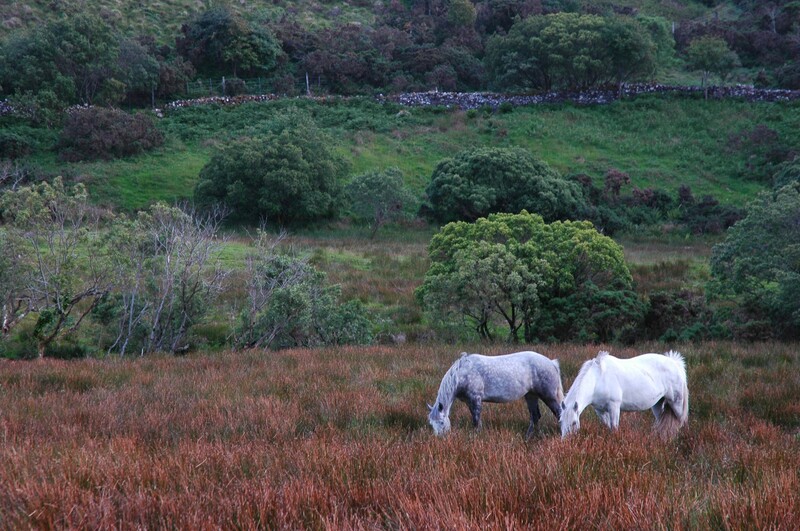 The landscape is iconically Irish, at times almost ridiculously so. Really, if I had seen one more white stallion galloping across a stony pasture, its mane flying in the wind, I was going to start looking for props men hiding in the gorse with walkie-talkies, saying “Oy, here comes another American. 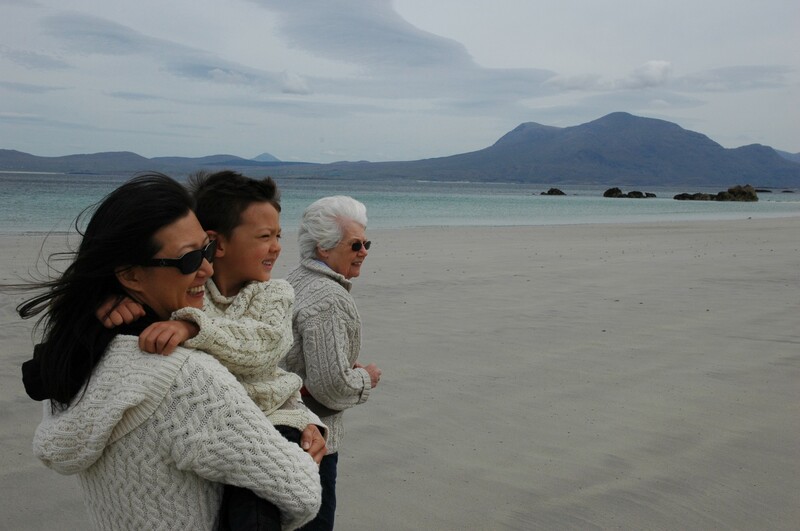 Cue the horse.” Lovely people, lovely mountains, lovely sea. There’s just no good reason not to go. Fantastic photos and handy to have so much information about the place I have wanted to visit since I was a child with a Connemara pony. I look forward to a steady stream of them – better alert the props manager. Get yourself there, Cuttlefish. Relive your childhood pony adventures! Sounds incredible! I’m enjoying reading along! 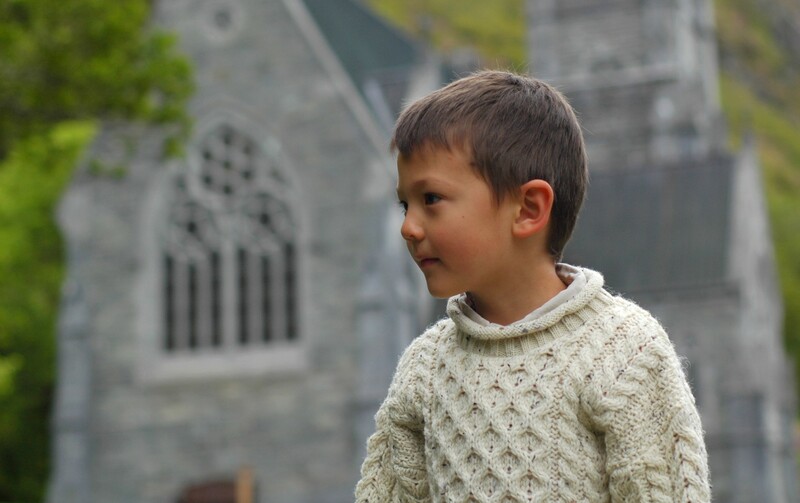 I am truly enjoying your continuous posts on Ireland. Thank you so much for sharing!